The protests and events occurring in Hong Kong beginning from September 2014, widely known under several terms such as Occupy Hong Kong and the Umbrella Movement, inspired a sudden burst of artistic productions, including documentary filmmaking, songs, installation art, paintings and other forms of creative resistance. This section documents some of these creations that specifically relate to women’s responses through the medium of film, both in front of, and behind the camera. Other multimedia links, events and women figures in the Umbrella Movement are also highlighted. Under The Umbrella – dir. Shannon Walsh. 2014 / 8 min. 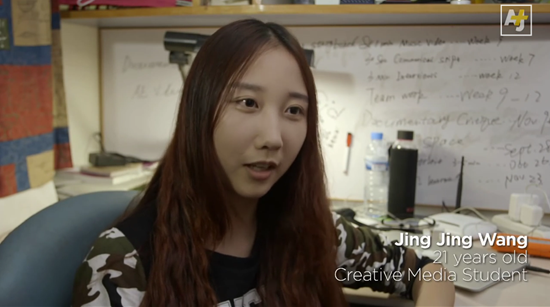 This short film documents the perspectives of three young women from different backgrounds during the Umbrella Movement. The three women are Vicky Do, a Vietnamese graduate student (and director of her own short film about the movement, Stranger From Paradise – see below); Jing Jing Wang, a newly arrived Shanghai native studying creative media; and Ansah Malik, a fourth-generation Hong Kong person. Under The Umbrella was shown as part of the Umbrella Movement Shorts Selection in the 2015 Hong Kong Independent Film Festival. The filmmaker: Dr. Shannon Walsh is an Assistant Professor at the School of Creative Media, City University of Hong Kong. She teaches and researches film, along with her filmmaking career. Her blog can be found at http://theartofeditinghk.wordpress.com/. Jing Jing Wang, one of the women who filmed her perspective of the Occupy protests for Under The Umbrella. 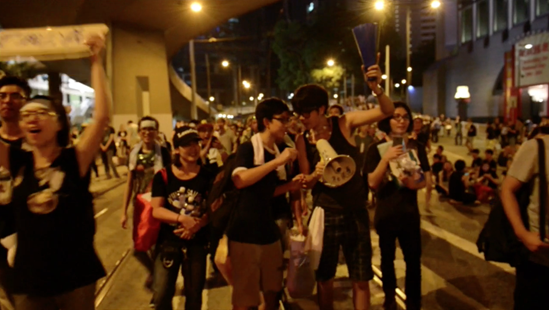 This short film features voiceovers of protesters explaining their thoughts and feelings over footage of the protests. This film was also shown under the title Occupy Movement, Hong Kong as a selection for the Umbrella Movement Shorts Selection in the 2015 Hong Kong Independent Film Festival. Marchenko interviewed protesters on the evening of September 29, 2014, by asking them to express the reasons why they were taking to the streets. The filmmaker: Daria Marchenko is a photojournalist and filmmaker, who is educated in journalism, photojournalism and media communications. She has worked as a professional photographer for several publications including Newspaper Métro and Phototerra Studio in Montreal, Canada. Her website is http://dariamarchenko.com/. This short particularly focuses on Mong Kok – regarded as the most chaotic protest site during the Umbrella Movement. The short intercuts with the interviews of protesters and footage of some of the intense moments between the protesters and the police. Midnight in Mong Kok was shown as part of the Umbrella Movement Shorts in the 2015 Urban Nomad Film Fest. The Filmmaker: Nora Lam studies at the University of Hong Kong and has a strong interest in cinematic works. She has joined the Campus TV, HKUSU as a student journalist. After Midnight in Mong Kok, she made two feature films about the umbrella (Road Not Taken and Lost in the Fumes) . For more information about Nora Lam, please click here.